No matter how far we go to relocate away from our mother country, our umbilical cord cannot be uprooted from the soil where we were born or we belong to ancestrally. We are naturally inclined to give back to the native land and serve the people there. It’s true about 16-year-old Indian American Sajni Vederey who recently donated $50,000 for digital education of underprivileged kids in rural India. Sajni Vederey from the US state of Virginia is a junior at Thomas Jefferson High School for Science and Technology. She is an inborn crusader and a budding philanthropist too. Her nonprofit foundation named STEM All Stars in Alexandria, VA has collected $200,000 so far for the welfare of over 15,000 girls from socio-economically disadvantaged families in developing countries, including India. In a recent act of support for computer literacy of kids in India, Dallas-born Sajni Vederey’s STEM All Stars donated 100 computers and 30 digital boards to 20 underprivileged schools in the Indian states of Andhra Pradesh, Telangana and Kerala. The nonprofit foundation commissioned the construction of a new library in Bhimavaram, a village in Andhra Pradesh by breaking ground this spring. The library will be a hub of books on science, math, biology, computer technology and other disciplines. 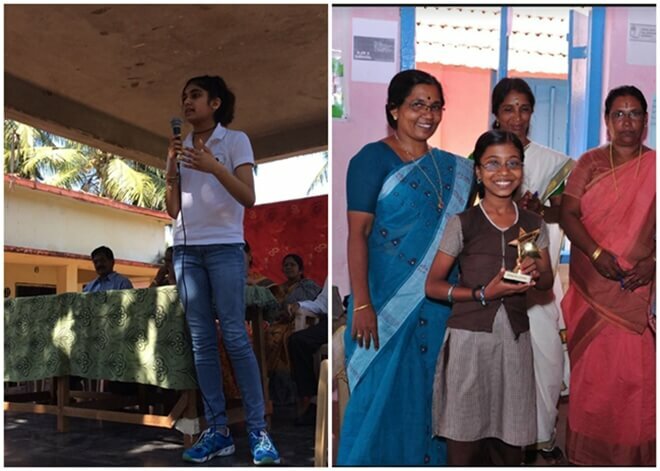 A resident of Great Falls in Virginia, Sajni Vederey was recently in India for 3 days and facilitated the ground-breaking ceremony for the library, which will open up the world of computer science and technology for the underprivileged girls in rural Andhra Pradesh. The founder of STEM All Stars, Sajni Vederey is on a mission to empower needy girls by motivating them to pursue careers in science, math, engineering and technology. In December 2017, Indian American Sajni Vederey received a donation of $50,000 from Vetukuri Venkata Siva Rama Raju in Andhra Pradesh. He is not only a lawmaker from Andhra Pradesh’s Telugu Desam Party but also a member on STEM All Stars’ board of directors. Besides, he is the director of VEM Technologies Pvt. Ltd., where computer systems are assembled as well as integrated for defense and aerospace. A trip to Hyderabad in August 2015 is what served as the foundation brick for the setting up of STEM All Stars in Alexandria, Virginia. During her trip to Hyderabad where her mom was born and brought up, Sajni visited a school in her grandmother’s neighborhood and noticed that the students’ academic growth and subject matter knowledge were stunted due to lack of learning materials and other resources. She also found no necessary amenities there. She volunteered at the school and interacted with the students to understand their needs and the academic ecosystem there. Much to her surprise, Sajni discovered that most of the students did not hear of Google. Upon her return from Hyderabad to Virginia, she founded STEM All Stars in Alexandria aiming to equip underprivileged schools in India with the amenities required for needy students’ fundamental computer knowledge, and pique the students’ interests in STEM studies. To break gender-based stereotypes is another goal of STEM All Stars. While growing up in the United States, Sajni herself experienced gender disparity and often heard, “Girls are bad at math and engineering.” The picture of gender stereotypes is more or less the same in the rest of the world. To empower girls in STEM fields in developing countries including India, and thereby mitigating the consequences of gender in equality is the vision of Sajni Vederey’s STEM All Stars. STEM All Stars which has so far provided STEM books, computers, lab equipment and other supplies to 55 schools across India. It has held several fund-raising galas and events for awareness about gender equality as well as STEM education of girls, in the United States. It also hosts STEM competitions in India. The 2018 STEM All Stars Competition was organized at Goethe Institute Hyderabad in January. Born to an immigrant couple from India, Sajni Vederey aspires to be a lawyer. Her father Jaganmohan Reddy from Hyderabad works for the US Navy. Sajni is a published author too. Passionate about creative writing and storytelling from the age of 6, Sajni penned a book titled Roo and His New Habitat, a fictional story about a group of students and their STEM skills, when she was in the middle school. This article is part of our continued exclusive stories about young Indian Americans and their achievements, at Travel Beats, a Desi community portal for Indians in USA. We not only offer the cheapest US to India flight deals at Indian Eagle but also cater community news, upcoming events and travel updates to Indian Americans through our free newsletters.